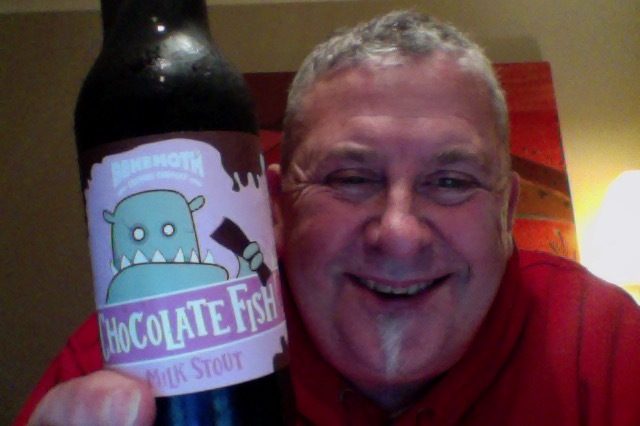 Finally what has to be the crowing glory in the GABS (Great Australasian Beer SpecTAPular) pack: the Chocolate Fish from Behemoth Brewing Company What could go wrong with a beer and a chocolate fish? A chocolate fish is a delicious pink marshmallow shaped like a fish and covered in chocolate. A Stout is delicious beer, together they should be deliciousnessness. This is a 330ml bottle of a beer that is 6.6% ABV and 196 calories a serve, this is around the 1.7 standard drinks worth of beer in NZ. A chocolate fish is a pink marshmallow shaped like a fish and covered in chocolate. Behemoth have created a chocolate Milk Stout that is chocolatey as chocolatey gets and added a load of raspberries to create the classic Kiwi treat in beer form. So get this into a glass and enjoy it at the end of a meal. Raspberries are strong on opening this, then you get a milk chocolate rush. An almost red black pour with a thin wistful head that drops off to leave a strange film atop the beer. The aroma is raspberries. That’s remarkable, Raspberry aroma is big, but not so big that it’s not held in check by the sweet milk addition and snapped into line by a bitterness that was quite welcome. If anything this is overly sweet if there was no context, but chocolate fish it is. As a beer without context you’d err towards it being a bit thin perhaps and peaky in the wrong place, as a beer that’s a homage to a sweet this is remarkably accurate and appealing. As it is it washes over the palate with ease and brings a smile each time, a fine and fitting end to a journey 6 pack, and if I could reach that high I’d pat the giraffe on the back and say thank you. Would I share with a friend on a porch and set the world to rights? Absolutely. This would be a great end of meal after ice-cream beer, or even with the ice-cream, it has so much going for it including the talking points about it being a chocolate fish, and a beer, and a chocolate fish…. 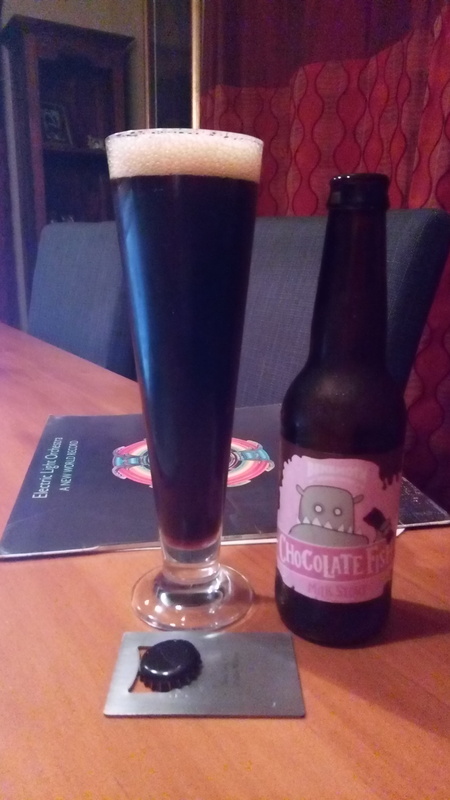 This entry was posted on July 23, 2017 by Philip Walter in Beer, Beer of New Zealand, Beer Review, Behemoth, Brewed By, Craft Beer, Critic, Sweet Stout, Vinyl and tagged Behemoth Brewing, Behemoth Chocolate Fish, Chocolate Fish, craft beer.